Although often seen as an unwanted expense and an inconvenience to use, it has been shown that property with a professionally installed Intruder detection system are 84% less likely to be subject to a successful break in, compared to one without. Intruder detection alarms can be supplied as stand-alone audible only systems to multi area high end signalled systems, depending on what meets you needs and your budget. By having a professional, monitored burglar alarm you can have peace of mind that your business is being looked after when you’re not about. Remote monitored systems can be installed that can provide Police response to Panic activations and Intruder alarms. In the rare event of a problem or false activation our engineering team are available 24/7 with 4 hour emergency response when it’s needed quickly. Systems can be designed to include perimeter protection to alert the police or key holders before entry is even gained into the building. Movement sensors can be utilized to protect large areas of a building from intrusion. Glass break sensors can alert to the shattering of glass should windows and glass panels be broken to gain entry. Multi-users and levels. 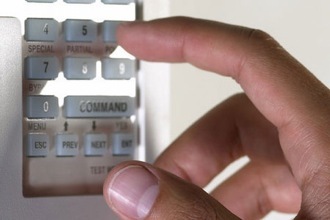 Different area setting and allocated keypads make intruder alarm systems flexible enough to suit all locations and budgets.